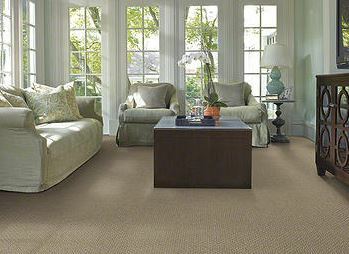 Carpet is soft, cozy, warm, sound insulating, and very easy to maintain. It is also one of the less expensive ways to get new floor coverings in your home. Carpet comes in a variety of styles, qualities and colors and is easy to match with new or existing decor inside your home or business. Carpet comes in a variety of different types: each one has its own advantages and style. Solid color plush carpet is not as soft as its counterparts (it can still be pretty soft!) but will show less foot prints and vacuum marks. Because of the tightness of the weave it will stay plusher longer than other types of carpet. A softer “lay your head on the carpet and go to sleep carpet” carpet. It also carries a certain shine to the carpet that makes it very attractive. This type of carpet has a different construction type than the previous two. It’s carpet fibers are looped instead of standing straight up. Usually it comes in a multi-color. It is more durable under foot traffic but not as comfortable under your toes. If you have pets make sure that you get the “zipper lock” type so that you won’t have any runs when Spot decides to go digging in your carpet. Exactly what it sounds like. It is a plush or berber type carpet with a pattern built into the fiber. Print Carpet is a plush or loop carpet that has a full color design printed on top of the fibers. It can look like flowers, zebra stripes, baseballs, or almost whatever you want! This is a cross between a plush and a berber. Some of the fibers are standing straight up and some loop over. Becasue it is built this way, you also create a pattern inside of the carpet. Bringing back the 70’s! This is the loosest type of carpet fiber to create a more modern shag type of carpet. Nylon Carpet – This fiber is considered by industry experts to be the most durable for foot traffic. It is soft and comes in a large variety of styles and colors.Since nylon is a fiber, it is prone to stains. To combat the stains most of the nylons that we sell are treated with an R2X stain treatment system. R2X is a stain treatment that encapsulates the entire fiber and backing. When a stain occurs it beads up like mercury and you can use a wet paper towel to blot it up. When you are finished, even if you have a light-color carpet, you will see no remnant of the stain at all.Most of the Nylon carpets that we sell carry a Lifetime Pet Stain Warranty. Please see the Carpet and Rug Institute for more information on carpet.